Am I alone in thinking that the new vending machine on Platform 2 of Hebden Bridge railway station looks a little out of place? A few years ago the station was given an expensive facelift, restoring it to its near original state. The ghastly fluorescent lighting (remember that, where they actually cut through the original Lancashire and Yorkshire Railway station signs to fit the tubes in?) was replaced with something more in keeping. The original signs were renovated and the station assumed the appearance that it had had for a hundred years. It even won awards for the sympathetic restoration work. And now someone has deemed it appropriate to put a large, brash, garish, brightly-lit vending machine on the platform. Not only does it look totally out of place, but it's a bit of a kick in the teeth for Antoinette and Lisa at the station buffet, which has recently won an award for being one of the best cafes in the country, and which sells a lot of the same stuff that the machine does. So why on the platform? If it has to be anywhere (and surely it doesn't really), why not somewhere more discreet - perhaps in that under-used corner of the ticket office? Yes, of course when the staff go home and lock up, people would be denied access to the pop and crisps on offer, but heavens, when the staff go home, we're not even entrusted with access to the loo, presumably because of the irresponsible behaviour of certain people. I wonder what makes the authorites think that a brightly lit machine displaying its wares,and standing there late at night completely unsupervised will not attract the attention of those self same 'certain people'! Perhaps I'm just standing in the way of progress, but it seems sad that, with all the effort and attention the station has received, the overall effect has been marred by this tawdry, twenty-first century contraption. People have been using the station for over 150 years without the need for this sort of thing. Are we now so effete and weak-willed that we can't do without our bottles of coke and our turkey flavoured crisps for a short while!! I think it is hideous and unnecessary too. 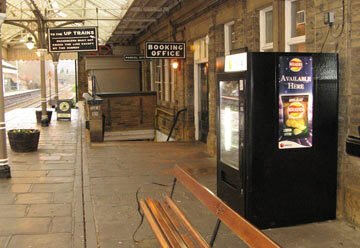 Friends of Hebden Bridge station agree that the vending machine is unsightly and inappropriate on a grade 2 listed building. When we heard rumours that one was to be istalled, I wrote to Northern Rail expressing our concerns , which are about both the visual impact and the potential adverse impact on the sales of the exceelent "Coffee Station" cafe. We also asked that if it was a fait accompli, then at least it was discreet without garish advertising. Unfortunately, we had no impact on either account. The machine could not be more garish, with its illuminated advert for a high fat snack product. Northern Rail's concern is to increase the facilities available to passengers; the visual integrity of a listed building is clearly of lesser concern to them. This highlights the conflict inherent in maintaining the integrity of an architectural gem against the mass market whims of our contemporary world. Complaints can be made on this Northern Rail page. Otherwise, you have to use the sitemap on the Northern Rail website to find it as they don't go out of their way to invite feedback, despite being so gushing about their commitment to good community relations. I've sent a letter to Heidi Mottram, Northern Rail's MD. No reply yet. I've also contacted Calderdale Council's Planning Department. Their Enforcement Section is already aware of this vending machine and is investigating. Although this tacky machine is not an alteration to the fabric of the building, it is a permanent addition - much in the way that a satellite dish is (and there are very strict rules about dishes on listed buildings). In the case of Hebden Bridge Railway Station, we are not only talking about a Grade 2 listed building, we are also talking about a building in the Hebden Bridge Conservation Area. The big question is - will the bureaucracy reach a decision before the machine becomes the focus of attention from certain undesirable elements, whose activities so often feature in this forum. Thank you for your e-mail, which I received recently. I was sorry to hear your views on the vending machine at Hebden Bridge. The machine was placed on the platform because the waiting room and the café are not always open when passengers are on the station. I understand that the colour is black and not red as are the ones that have been placed on other stations. This is so that the machine is sympathetic to its environment. There are no plans to remove the machine. Thank you again for taking the trouble to contact me. This is the very generic response I got. Thank you for your correspondence, which I received recently. I am sorry that you are unhappy with the provision of a vending machine at Hebden Bridge. We are sympathetic to the heritage of the building and adhere strictly to all regulations regarding installation and work at the station. The machine was installed for the comfort of passengers when the café is closed or when it is busy and is not intended as direct competition. We inspect all our vending machines to make sure that people are still using them. If we find that they are not being used then they will be removed. Thank you again for taking the time to contact me. I sincerely hope that future use of our services gives you a more positive impression. It is ugly, and hopefully no threat to the excellent shop - a railway cafe where you can sip green tea while listening to Radio 3, as I did this morning, is to be cherished!